Hey Mount Doug, are you in any clubs or sports at our school? If so, then you should buy a yearbook to remember that time to provincials in field hockey or heading to Vancouver for WE Day! 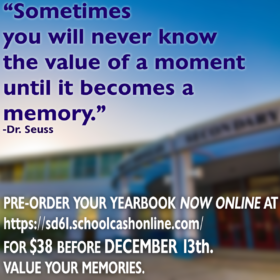 To order your own, head on to the school website before December 13th and click on ‘online fee payments’. Remember: Yearbook? You’re in it.